By John D’Angelo, PhD, P.E. 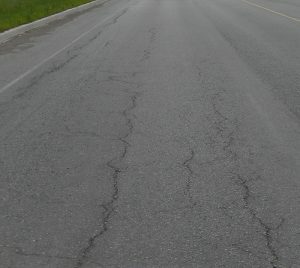 There has been a growing concern about pavement performance in the U.S. Observations such as “the roads turn gray very soon after paving” and “cracking is showing up sooner than expected” are being voiced. The types of cracking in the pavements are changing also. Where the issue used to be low-temperature transverse cracks or bottom-up fatigue cracking, now there are more longitudinal cracking in the wheel path and surface raveling. The pavement in the picture is only one-year-old and it is showing severe distress. Many highway agencies are looking for solutions to these problems. In the 1970s and 80s the major issue was pavement rutting. Pavements were experiencing permanent deformation soon after opening to traffic. This problem brought on the SHRP program that provided the Superpave Design System. With the implementation of Superpave in the 1990s rutting issues dramatically reduced. At the same time, the cost of asphalt binder saw some significant jumps in price. In the early 2000s the paving industry was seeing some significant changes. The amounts of recycled asphalt pavement (RAP) and recycled asphalt singles (RAS) used in mixes was increasing. The demand for extreme binders – those with high, high-temperature performance grades and low, low-temperature performance grades were increasing. These were grades such as PG 70-28, 64-34 and 58-34. New asphalt binder additives were being tried to help meet the new extreme grade demands. Into this mix comes the issue with increased early cracking of pavements and the search for the cause. Was it the new Superpave Design system that took too much binder out of the mix? Is it the increased use of RAP and RAS that replace new binder with old? Or is it all the new additives being put into the binders to help meet extreme grades? All these variables make it a very complicated problem to solve. One approach being used to address the cracking issue is to rely on mixture performance testing. It is suggested, that instead of trying to control all the individual components we should control the mixture. Researchers and highway agencies have been looking at ways to adjust the mix to reduce cracking. Some agencies have increased Voids in Mineral Aggregate (VMA) requirements, others have reduced design air voids, still others have reduced design gyrations. All of this has been done in an effort to get more binder into the mix. Some agencies have reduced the design air void level in the mix. While increasing VMA and or reducing design voids will increase binder content, reducing gyrations levels does not have a direct effect on binder content when the gradations are modified. There is a growing interest in the industry to look to mixture performance testing to control mix cracking. Many highway agencies have implemented mix performance tests for rutting. Tests like the Hamburg Wheel Tracking (HWT) test and the Asphalt Pavement Analyzer (APA) have been included in mix design and quality assurance programs for years. The emphasis now is to develop cracking tests to provide guidance on the ability of the mixtures to resist cracking. Combining the rutting and cracking together is the basis for the concept of balanced or performance-based mix design. Over the past several years, highway agencies have been evaluating many different cracking tests for use in mix design and quality control. Those tests include the Louisiana Semi- Circular-Bend test (SCB), Disc Shape Compact Tension Test (DCT), the Illinois I-FIT test and the Texas Overlay Tester (TOT). In the late 1990s and early 2000s Texas started to identify early cracking in some of their pavements. An effort was made to develop a test that would evaluate the ability a mix has to resist cracking and provide long-term performance. The initial development of the TOT was to evaluate reflective cracking. Like any mix test, the first item is to determine the specimen geometry. The developers elected to go with a 150mm diameter circular specimen. This size allows typical gyratory compacted specimens along with cores from the roadway to be tested. The final specimen thickness is 38mm again allowing cores from typical surface mixes to be tested. The two sides are also saw cut from the specimen leaving a 150mm long by 76mm wide by 38mm high specimen as shown below. Once the specimen has been cut to the correct dimensions it is glued to a split base plate. Once clamped into the testing machine, one side of the base plate is locked and the other side slides back and forth applying a load to the specimen. The displacement is 0.6mm and the force required to move the plate is measured. One loading and unloading cycle takes 10 seconds. The testing continues until the load reduces to 93 percent of the initial load to create the opening or 1200 cycles. All testing is done at 25°C, an intermediate temperature to better relate to durability and fatigue cracking. Texas has done extensive testing of their existing pavements to correlate TOT results to pavement performance. With this information, they could establish mix design requirements for high-performance mixes. The table shows the Texas requirements for high-performance mixes. These are defined as the fine graded PG 76 mixes. Here, the Hamburg wheel tracking test is used for high-temperature rutting, the overlay tester is for cracking and the Cantabro test is used for raveling. Using the mix performance tests in the design process is the Texas DOT’s approach to balanced mix design or performance mix design. Another DOT that has adopted the TOT is New Jersey. In New Jersey, the use of performance testing in the mix design process is used for specialty mixes such as ultra-thin overlay and as shown in the table below for mixes with high RAP contents. These are surface mixes with greater than 20 percent RAP and intermediate course mixes with greater than 30 percent RAP. In the New Jersey design approach, the Asphalt Pavement Analyzer is used to test for rutting and the TOT is used for cracking. An important note is that the New Jersey criteria is different from the Texas criteria. None of these tests measure fundamental engineering properties. Results vary based on mix type, climate and pavement structure. So, criteria must be established by each agency for the types of mixes and pavements where they will be used. New Jersey DOT did their own extensive evaluation of TOT results to pavement performance to establish their criteria. So, the question is why haven’t more state DOTs adopted the TOT? There are many issues that keep DOTs from adopting the TOT or any of many other performance tests for mix design. With the TOT one issue has been repeatability of the test. In the Texas test procedure, at least three samples must be tested to produce one result. The variability in results is also quite high. The researchers have been continually working to improve the test and reduce the variability. Other issues are testing time and cost. Including performance tests like the TOT in the design process significantly increase the time needed to produce the mix design. It also adds another costly piece of equipment in the lab. There are also competing tests being used for cracking. In Louisiana as part of their balanced mix design, the semi-circular bend test is being used. In Illinois, a modification to the semi-circular bend test – the I-FIT test – is being used. And the list goes on. As we move forward into the future there will be many more agencies adopting the balanced mix design approach using tests like the TOT. These agencies will have to evaluate which test best fits their needs and level of effort. Each agency will also have to do research to establish what the criteria will be based on their local climate, materials, construction practices and pavement structure. We are demanding more from our roadway now than we ever have. There is higher traffic and heavier loads. We are using greater quantities of recycled materials. All these demands should bring the agencies to use balanced mix design using performance tests to optimize the mix for performance. D’Angelo is an asphalt consultant based in the Washington, D.C. area.